Scientists are amongst a team of researchers who have found that the very early Universe was not only very hot and dense but behaved like a hot liquid. 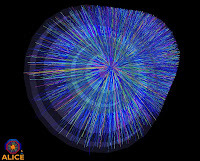 The discovery is the result of accelerating and smashing together lead nuclei at the highest possible energies in the Large Hadron Collider’s (LHC’s) ALICE experiment, recreating the conditions that existed in the first microseconds after the Big Bang. Scientists from the University of Birmingham, funded by the STFC, are playing a key role in this new phase of the LHC’s programme which comes after seven months of successfully colliding protons at high energies. The lead-ion collisions generate incredibly hot and dense sub-atomic fireballs or ‘mini Big Bangs’ with temperatures of over ten trillion degrees. At these temperatures normal matter is expected to melt into an exotic, primordial ‘soup’ known as quark-gluon plasma. The first results from lead collisions have already ruled out a number of theoretical physics models, including ones predicting that the quark-gluon plasma created at these energies would behave like a gas. Although previous research in the USA at lower energies indicated that the hot fire balls produced in nuclei collisions behaved like a liquid, many expected the quark-gluon plasma to behave like a gas at these much higher energies.